Video - See it in action! Successful leaders make every effort to leave a positive and long lasting impression in the minds and hearts of customers and employees. Custom vinyl binders by PackZen are an ideal way for any business to communicate a powerful visual image that keeps on giving. Custom ring binders help turn any presentation into a memorable event. 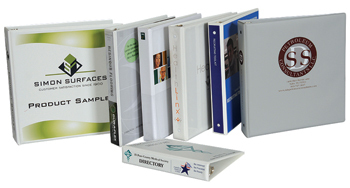 Purchasing custom binders from PackZen is practical and affordable. You’re going to purchase binders anyway, so why not add a touch of class to your training or sales presentations? Vinyl Binders can be made attractive by employing various decoration techniques. PackZen specializes in full color Digital, Screen and Litho printing. Foil stamp, embossing, debossing are also available. If you’re not quite sure how to make your custom binders look distinctive and professional, let PackZen design them for you. Just imagine how your company binders will look after adding custom artwork and designed accents. Even if your event is just around the corner, PackZen specializes in delivering rush orders right on time. The PackZen art department and production team are accustomed to delivering stylish binders that make your organization look great. Clear view binders add flexibility by allowing you to change your binder covers and spines. With the aid of our automated equipment, we can heat seal your cover sheets in the three-ring binder of your choice. We’re expert at designing and producing vinyl binders made from an assortment of materials, including Suede, French Calf and Expanded vinyls. Speak with a PackZen representative today to order custom three ring binders for your business or organization. ?